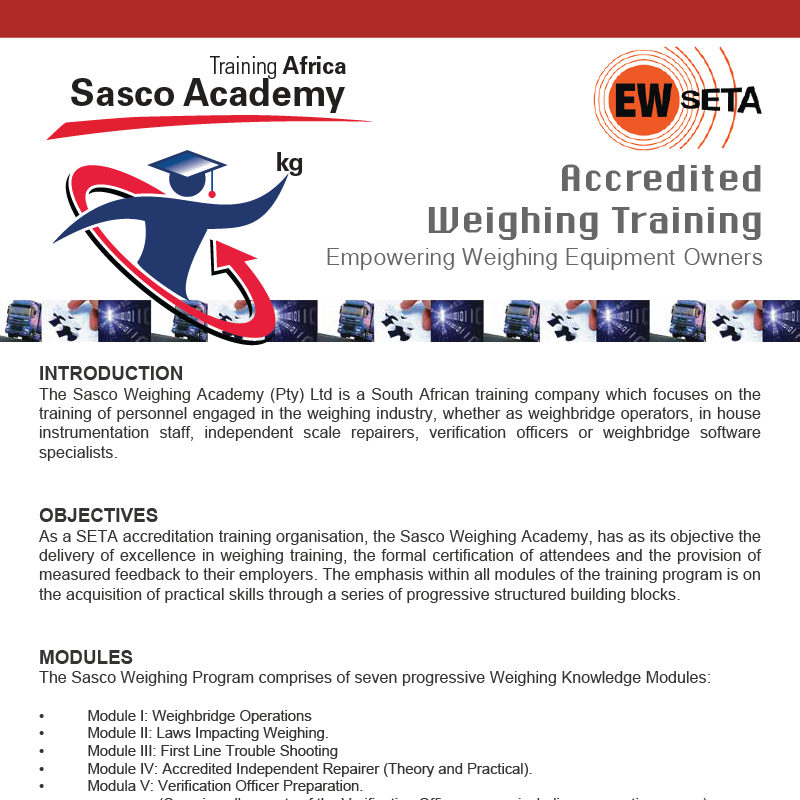 The Sasco Weighing Academy (Pty) Ltd is a South African training company which focuses on the training of personnel engaged in the weighing industry, whether as weighbridge operators, in house instrumentation staff, independent scale repairers, verification officers or weighbridge software specialists. OBJECTIVES: As a SETA accreditation training organisation, the Sasco Weighing Academy, has as its objective the delivery of excellence in weighing training, the formal certification of attendees and the provision of measured feedback to their employers. The emphasis within all modules of the training program is on the acquisition of practical skills through a series of progressive structured building blocks. SDL RECLAIMS AND BBBEE: Skills development is central to the South African Government’s transformation policies. Accordingly the BBBEE new scorecard learning Programme Matrix (400A) specifically deals with skills development and SETA accredited facilities. Furthermore companies that make SDL contributions are registered with a SETA and have skills plans in place, are entitled to reclaim a substantial proportion of these levies back. The Sasco Weighing Academy can provide the documentation required in this regard.